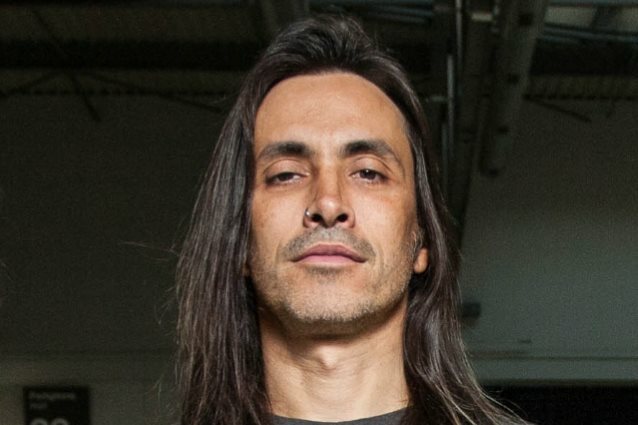 EXTREME guitarist Nuno Bettencourt has told Great Music Stories that he and his bandmates are "a little bit disappointed" in themselves that they have yet to release the long-awaited follow-up to 2008's "Saudades De Rock" album. "We've been writing, we've been working, we've got mounds and mounds of songs that we wanna do, and we're actually finally excited that right now, as we speak — we've probably been saying this in interviews for the last five, six, seven years, but it's more realistic at this point right now — we have songs that we are very excited about," he said (hear audio below). "What motivates us is always new music. We love playing the old stuff, of course, and touring, but we try not to tour as much," he continued. "I think doing the 'Pornograffitti' [twenty-fifth-anniversary tour] gave us a little bit of motivation, but we love sharing new music. So we're in the process now, and we have no doubt that by the end of this year, early next year, there will be an EXTREME album that we're very excited about." Bettencourt also lamented the fact that record labels today don't develop artists the way they used to, with many up-and-coming musicians relying increasingly on word-of-mouth marketing and do-it-yourself ethos. "I'm sad for younger bands that don't have a home that they know they can go to," he said. "Like the twenty-five labels that used to be around that they know they can hang their hat and know that they'll give 'em three, four, five albums to develop. Imagine the bands that we grew up with not getting a chance to do that. Or even just one album. Starting from THE BEATLES onward. I mean, THE BEATLES were a different band by the time they got to 'Sgt. Pepper's' and 'Rubber Soul' and all that. I think that's the only sad part, and I'm hoping that it's gonna change for the better, that there will be a bit of a revolution and people will wanna come back to that. And humans playing a bit more. "I think Joe Walsh said it not too long ago: there's not enough people testifying and actually just doing it for the love and having a story to tell," he continued. "Everybody used to be busy writing songs — great songs — that became hits. Now everybody's writing hits. Everybody's desperately writing a hit because they know they can't survive if they don't have a hit. Where in the past, we were writing a song like 'More Than Words' on a porch, not really believing it was gonna be a hit. We had hoped, but we were just trying to write a great song, and then it became a hit." Nuno added: "I live in L.A. and whenever I get together with anybody to write, everybody is obsessed and fearful and wants to write a hit for everyone else. They wanna write a hit for Rihanna, they wanna write a hit for Katy Perry. And it's all the same four or five guys that are trying to write hits for MAROON 5, for… you name it. And you can tell."